Participants of the meeting at the ITER site: left to right: Lars Lindberg Christensen (ESO), chair: Petra Nieckchen (EUROfusion), Bernd Ebeling (European XFEL), Ana Godinho (CERN), Delphine Chenevier (ESRF – European Synchrotron Radiation Facility), James Gillies (CERN). “Science isn’t finished until it is communicated,” Sir Mark Walport, UK Government Chief Scientific Adviser until 2017. ITER, the largest fusion experiment under construction in Cadarache, France, served as the perfect setting for the annual meeting of the EIROforum Communications group. Five of the eight EIROforum members met to discuss a number of communication topics of mutual interest. EUROfusion, one of the founding members of the EIROforum partnership and the EIROforum chair for the period 2018-2019, was the organiser for this year’s meeting at ITER. 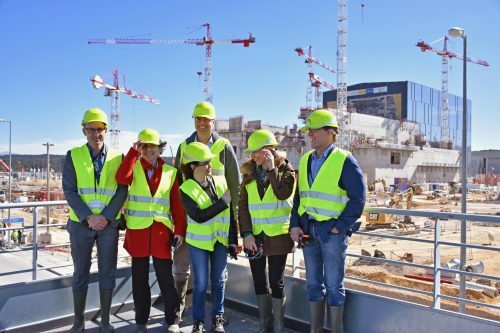 The ITER site was an apt location meeting not only because it was a perfect sunny day to welcome the other EIRO members, but also because ITER lies at the heart of EUROfusion research and is central to the Roadmap to the realisation of fusion energy. ITER also provides the perfect example for discussing communication challenges for Big Science projects, relevant to all the EIROforum members, CERN, EMBL, EUROfusion, ESA, ESO, ESRF, European XFEL, ILL, all of which manage large, international infrastructures, facilities and research programmes. The EIROforum communications group, which is made up of the Heads of the Communications Departments of the members, has been assisting the partnership by providing communication channels, disseminating news and organising events. In 2017, the group finalised a renewal of the corporate identity and web presence. Have a look at www.eiroforum.org for more information.